I started the beginning of this year with the hope that more psych rock of all stripes would come through Oklahoma and play a few shows here and there in the OKC metro. Obviously if that happened, then I would be happy and life would be good. And to an extent there have been psych rock groups who’ve come through, especially around Norman Music Festival time, as several took the main stage and played around the metro on their way through, and NMF also took place the weekend before Austin Psych Fest too. I was at both of those events and loved it every bit of it, from the gritty to the glorious. But it still isn’t enough to get me through a whole 365. I’m sonically greedy like that. I know Oklahoma City also has its own brand of emergent psych rock with new groups like Horse Thief, who’ve got a psych-folk-indie vibe and others who channel darker and heavier sounds, like Psychotic Reaction. There’s even some dream pop/shoegaze bands, like Power Pyramid, who are attracting the attention of listeners and reviewers outside Oklahoma City. 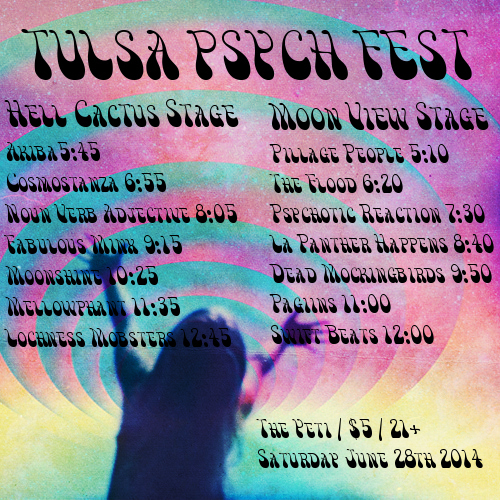 Even so, I couldn’t have anticipated that an event like Tulsa Psych Fest would kick-off this year too. Naturally I had to interview the organizers. Who, as it turned out, were at Austin Psych Fest the same weekend as OKC.NET. How we did not know each other before now is inconsequential. Like minds, kindred spirits, or whatever, it’s a wonderful thing when you find more people who love the same things you do in places you didn’t even think to look for them. OKC.NET: How did this event come about, was it born out of a growing psych rock scene in Tulsa? And who is involved? Sarah Dickenson: Tulsa has had a rich yet small music scene for a long time. It is ever evolving and growing stronger. Basically, myself and a group of musicians in Tulsa wanted to do something that our city hasn’t seen before. I pretty much took the wheel and got everything going. Jonathan Robinson of the Yeti has been a huge help. OKC.NET: How did you end up with the line up that you did? Sarah Dickenson: We invited bands from all different states that we knew and had seen before. It started as an excuse to get as many of our friends around the country together for one awesome show, which soon turned into a mini-music festival. As far as the locals go, we asked bands that we knew would put on great performances. OKC.NET: Does a lot of indie psych rock come through Tulsa these days? Sarah Dickenson: We’ve had quite a few psych, garage, and indie bands come through in the past few years. Slowly but surely, we’re putting our name on the map for a worthwhile stop on tour. Just to name a few, Shannon and the Clams, Burnt Ones, Wax Idols, Organs, Mr. Elevator and the Brain Hotel, Nobunny, Bad Sports have all played downtown. OKC.NET: What publications are you reading in regards to who’s in the genre, or do you have forums you’re involved with, or are you using Spotify or Soundcloud to find some of these artists, or perhaps some of this is by word of mouth too? Sarah Dickenson: Honestly, Facebook is a great tool for finding bands. I would check out bands I knew, then look at who they’ve played with recently and reach out to them. Like I said though, a lot of the out of town guys are old friends we’ve met in our own traveling. OKC.NET: Who are your sponsors, if any? Sarah Dickenson: Midnight Creeper Records is currently our only sponsor. They will be sponsoring our merch area that night. We’re starting small and we’ll work on getting big sponsors next year. Gotta see how everything turns out. OKC.NET: So this event is one day at the Yeti and being billed as a mini-music festival, could you see this growing into something bigger if the response is pretty good? Sarah Dickenson: Definitely. That’s our plan. Austin Psych Fest started out at one bar. Next year we’re looking to have more stages, more bands, and sponsors. OKC.NET: What’s one song or album you can’t stop listening to? Sarah Dickenson: Pretty much every time I get in the car I put on Mikal Cronin’s MCII. OKC.NET: If you could invent a psych rock group out of thin air, what would their name be and who would they sound like? And go! Sarah Dickenson: Oh man, they probably sound like Thee Oh Sees and Black Sabbath. Band names are always difficult! How about Black Seas? Ha! OKC.NET: What was your favorite part of Austin Psych Fest? Sarah Dickenson: The Zombies set, hands down. It was amazing to see living legends in a fairly intimate festival setting. The psychedelic light shows by Ether Wave were great. You can catch them at Tulsa Psych Fest as well! Stoked to have those guys on board. If you want to listen to some of the bands playing that night check this Soundcloud playlist. There are some that aren’t on the platform, but you can check this link for a list of each band and their web address. Or just go and be surprised by what you hear. It’s only $5. Tagged Ariba, blues, Cosmostanza, Dead Mocking Birds, Fabulous Minx, Garage Rock, La Panther Happens, Mellowphant, Moonshine, music, Noun Verb Adjective, Pagiins, Psych Rock, Psychotic Reaction, Surf Rock, The Flood, The Lochness Mobsters, The Swift Beats, Tulsa Psych Fest. Bookmark the permalink.